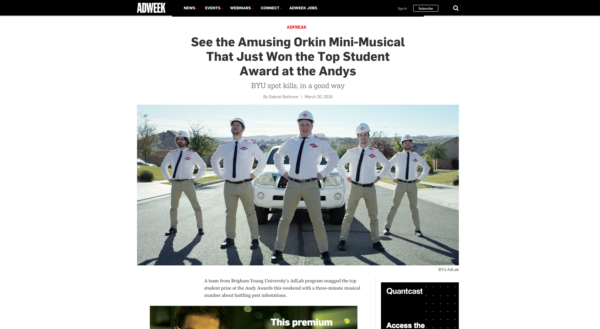 When The ADVERTISING Club of New York decided to take the International ANDY Awards judging live in 2018, they turned to DGC to generate interest and submissions for the event; manage news coverage pre- and post-event; handle any onsite crises that could potentially arise as a result of livestreaming an event that featured world-class creative judges; and oversee the club’s social engagement across four social media channels. DGC created a social strategy leveraging the power of the jury participants’ agencies, and the jurors’ original video content, calling on the industry to tune in! On the press front, we recommended an exclusive offering to Ad Age’s Creativity with an eye on managing and curating the “behind-the-scenes” story as it played out through the production process and in real-time. Post-ANDYs, we pitched multiple story angles to ensure additional coverage, and provided reporters with highlights/insights from the livestream, as well as distributed a release with key moments, winners, etc. The success of this first-time experiment was overwhelming in terms of press and social visibility. The show’s livestream garnered over 250,000 views, and a stream of stories written about the initiative globally, including extensive coverage in Ad Age Creativity, The Drum, Adweek, Campaign US, and Campaign Brief Asia. At least two ANDY Award-winning students have been hired by agencies, and the jury discussions went well beyond our industry and touched on many of the issues facing our world today. More than creatives simply reviewing work, the experience has been celebrated as an educational tool that lifts the veil on award show judging and brings transparency, education and inclusion to the process.